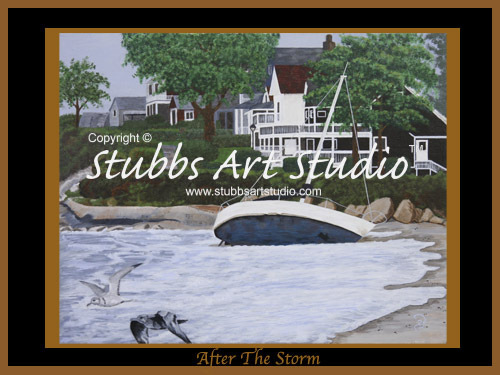 In the aftermath of last nights noreaster, with howling winds and pounding surf, it was not hard to believe that a sailboat broke free from its morring. If not for this single vessal, one could hardly tell the mighty storm ever roared. All was quiet and peaceful as the morning surf lapped on the sandy shore of Niantic's Crescent Beach and against the once proud ship that now lay on its battered and broken hull. In this acrylic on canvas painting by Barb Stubbs you will experience the sobering reminder that nature is both powerful and beautiful.